In Marseille last week I stumbled across an intriguing new CD in a store. Paz, Salam & Shalom is, as the title suggests, an exploration of medieval songs from the Sephardic, Muslim and Christian traditions. Part of the appeal of the new release is the accompaniment that subscribes to the view that authentic performances are a somewhat silly tradition by including Tibetan bowls and seed pods from the flamboyant among the percussion. Compellingly performed by Canticum Novum and directed by Emmanuel Bardon, the CD is beautifully recorded in the church of Pommiers in France and released on the small independent label Ambronay. It is a delightful disc which I thoroughly recommend to readers, but that is not the reason for writing today. When I was in Paris two weeks before travelling south, news had come of the death of Montserrat Figueras. She was, of course, the wife of Jordi Savall and the star of so many great recordings. But Montserrat Figueras, who is seen above, was so much more than a great voice and a great recording artist. She was a central figure in a movement that made classical music more inclusive and more human. She forged a path that Emmanuel Bardon, who studied and recorded with her, and many others have followed. Montserrat Figueras' legacy is not just the memory of her live performances and the solace of her recorded testament: her legacy is also that she made the world a better place. 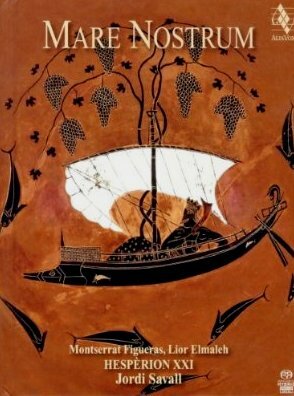 Since returning from France I have been spending time with the newly released Mare Nostrum, Orient-Occident Dialogues. 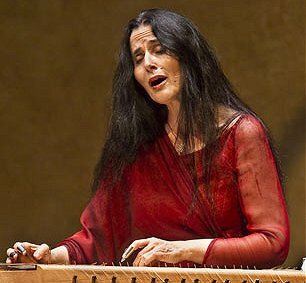 This was recorded by Montserrat Figueras, Jordi Savall, Hesperion XXI and guest musicians from Armenia, Turkey, Bulgaria, Israel, Greece, Morocco and Palestine between December 2009 and July 2011. In typically elegant Alia Vox style the two CDs come in a lavishly produced book which includes many session photos and a powerful essay on the Arab Spring by Tahar Ben Jelloun. 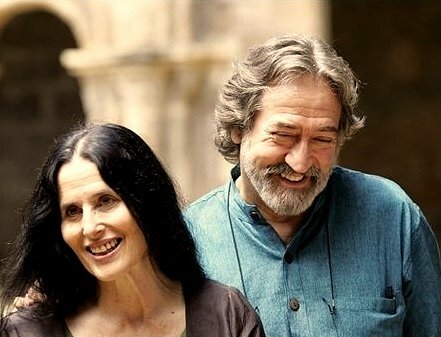 Mare Nostrum returns to the cultural and musical themes that have occupied Montserrat Figueras and Jordi Savall over the past four decades; but there is a new quality of reflection and transcedence in the interpretations that makes this one of the most moving recordings I have ever had the privilege of listening to. Mare Nostrum is playing on my audio system and I find it too difficult to write anything more. * Mare Nostrum is being performed at the 2012 Aldeburgh Festival without voices. More here. 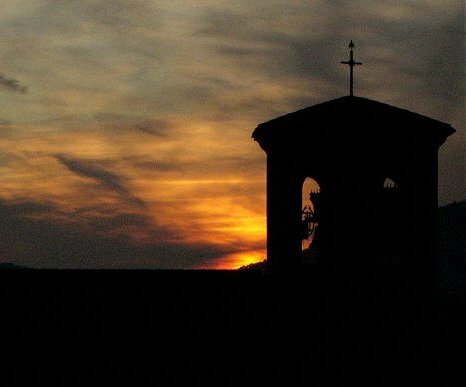 Header photo was taken on my French trip at L'Abbaye de l'Annonciation at Le Barroux. and is (c) On An Overgrown Path 2011. All featured recordings were bought at retail. Report broken links, missing images and errors to - overgrownpath at hotmail dot co dot uk Also on Facebook and Twitter.